There are other tutorials on Editing Corp. regarding 3 dimensional texts in After Effects, but the most effective way of all is by using the Shatter Effect plugin. It is a built-in After Effects plugin which helps you break and shatter things. 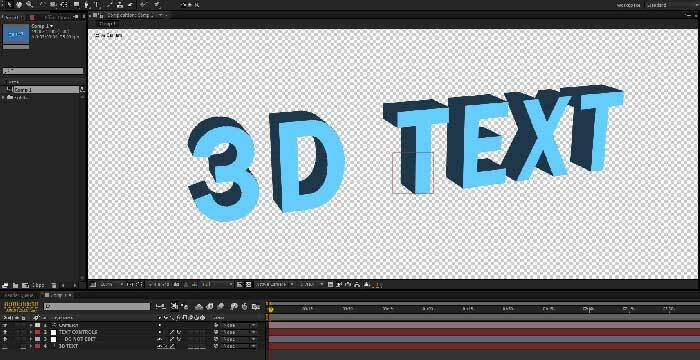 The step by step method for generating 3D text is explained in the tutorial ‘How to create 3D Text in After Effects with Shatter Effect‘. If you really want to learn something new today, skip this article and head straight to that 3D Text tutorial. 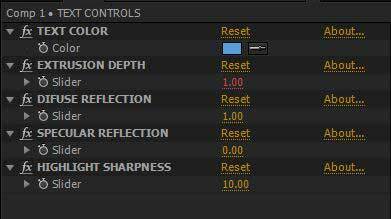 But, if you want to save yourself some time and efforts, download this free After Effects Project file. In this project, I have pre-created all the layers and effects that together converts a 2D text layer into 3D. Also to simplify the project, I have created a null layer, added some expression control sliders and linked them to the required settings under the Shatter Effect. If you go through the tutorial video (link is in the second paragraph), you will notice that changing the color, extrusion depth and other settings means manipulating with the Shatter Effect properties. For professional users, it’s as easy as pie, but it can be hard for someone who is in the learning phase. This free After Effects Project File has 4 layers – Text Layers, Shatter Effect Layer (named as ‘Do not edit’), Text Controls Layer and a camera layer. The Text Layer holds your text, so change it with your own, double click on it and type in anything. Since the text is generated from the shatter effect, do not turn on the eye switch of the text layer, else you will also see the plain 2D text along with the 3D one. Do not edit layer holds the shatter effect. You don’t need to change anything in that layer. As the layers says ‘Do not edit’, ignore it and move on to the next one. Text Controls layer is the hero of this project file. It contains all the essential settings to change the look of text. The color palette can be used to changed the color of the 3D Text while the Extrusion Depth value controls the thickness. Difuse Reflection, Specular Reflection and Highlight Sharpness further enhances the looks. Since, our 3D Text is not just 3D looking, it is in 3 dimensional space, I have added a camera layer in the project for you to orbit around, pan or move the text. Watch the video below to learn more about this free After Effects Project File for creating 3D Text.